The built heritage of Trinidad has been under threat for the last 60 years, as private houses, public buildings and various 19th century structures have given way to modernity, reflecting the extent to which Trinidad and Tobago does not require the visitor market to look at its 19th century colonial architecture, as is the case in many of our neighbouring islands, former colonies of the British Empire, who must depend on the tourist trade. We, however, depend on the petrochemical industry as our main hard currency earner. The political will to save the built heritage also does not exist, as the politicising of the country has had more to do with the eradication of the past in terms of records, archives and built heritage. 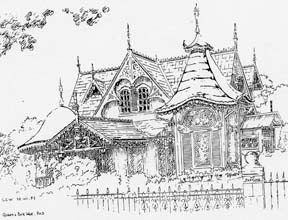 Seen here are drawings of various houses connected to the following story. La Chance and Perseverance have been destroyed. Champs Elysées has been remodelled for the purpose of the Trinidad Country Club. Cumberland House has been remodelled for the purpose of government offices. 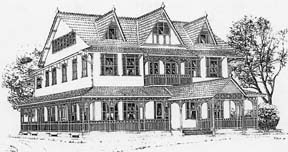 The Boissière house on St. Vincent Street and the Boissière House at Queen's Park West still exist, both are in the hands of members of the same family that established itself here in the last decade of the 18th century, before the British Conquest of Trinidad in 1797. The property and residence of John Boissière, this building was the second built on the site. It replaced the original house that had been erected in 1779 for Rosa Marquise de Charras, née de Gannes de La Chancellerie by her son of a previous marriage, Phillip Rose Roume de St. Laurent, who was responsible for the framing of the Cedula of Population. Illustrated by Peter Shim. 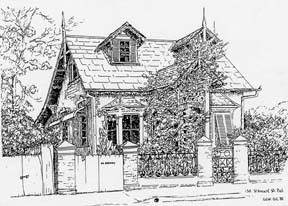 built and lived in by Eugene Boissière 1870's. Illustrated by Gerald Watterson. by the 1920's, added many embellishments. He lived there in extravagant style until, faced with business reversals, he too was forced to sell. In 1926, Perseverance was sold to an English Man, James Evans. Cumberland House, which once stood on Cumberland Street now Abercromby Street was built by Jules Cipriani. 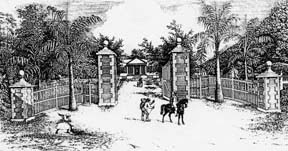 He became a successful businessman, and owned several cocoa estates at the turn of the 19th century. He was a commission agent and an exporter of locally grown produce. Illustrated by Peter Shim. 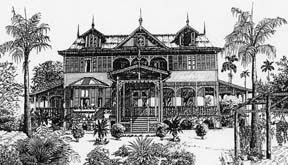 was the property and residence of Gaston de Gannes de La Chancellerie who was born in Trinidad in 1838. In the 1860's he married Miss Sophie Cipriani "and took his young bride up the Caroni by corial, or dug out canoe". 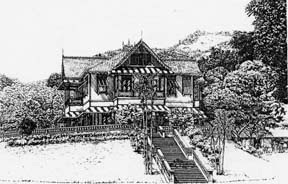 On the banks of the river, just south of the village of Arima, he developed a large cocoa estate. A few years later he acquired some 50 acres on the 0 'Meara Road to the south of the old Arima Railway Station and there he built La Chance. Illustrated by Peter Shim. Charles Boissière inherited his father's business Eugene Boissière & Co. in 1910. He retired from active business in the 1920. Illustrated by Gerald Watterson.